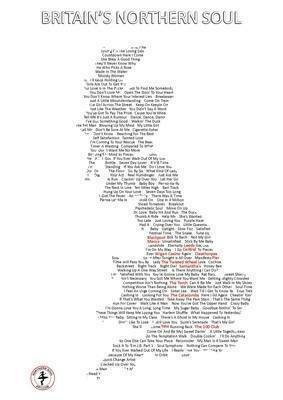 Northern Soul record titles arranged into the shape of Great Britain. The big Northern Soul clubs are in red. "Britain's Northern Soul" is a signed, limited edition print (250 copies commissioned). Ten of the great Soul Clubs (shown in red), and over 180 Northern Soul record titles (shown in black) arranged in the shape of Britain. The clubs, are of course, in the correct geographical position on the map! The graphic design has been created by Pete Doyle. Three sizes of this print are available, A3 (11.7" x 16.5"), A4 (8.3" x 11.7") and 7" x 5". We are sure that you will like the print, but if not, for any reason, please return for a full refund. Post and packing is free in the UK, with low rates for air mail to other destinations.